What is Reliable Server Pooling (RSerPool)? Released version 3.2.0! This version includes various fixes, as well as the change from the autoconf/automake to CMake build system. Also, Clang/Clang++ is supported now as well. Happy Birthday, RSerPool! Today, the main RSerPool RFCs turned 10 years old! New stable versions of sctplib and socketapi available for download. Note: you only need userland SCTP for special-purpose setups. In most cases, simply use kernel SCTP for rsplib! A new stable version of rsplib is available: 3.1.7! This new release particularly fixes some FreeBSD build issues. A new stable version of rsplib is available: 3.1.6! A new stable version of rsplib is available: 3.1.5! A new stable version of rsplib is available: 3.1.4! Our cooperation project with Hainan University on RSerPool optimizations has been awarded with the "Scientific Research Accomplishments of Institutions of Higher Education of Hainan Province Award". A scan of the award document, including an English translation, can be found here! 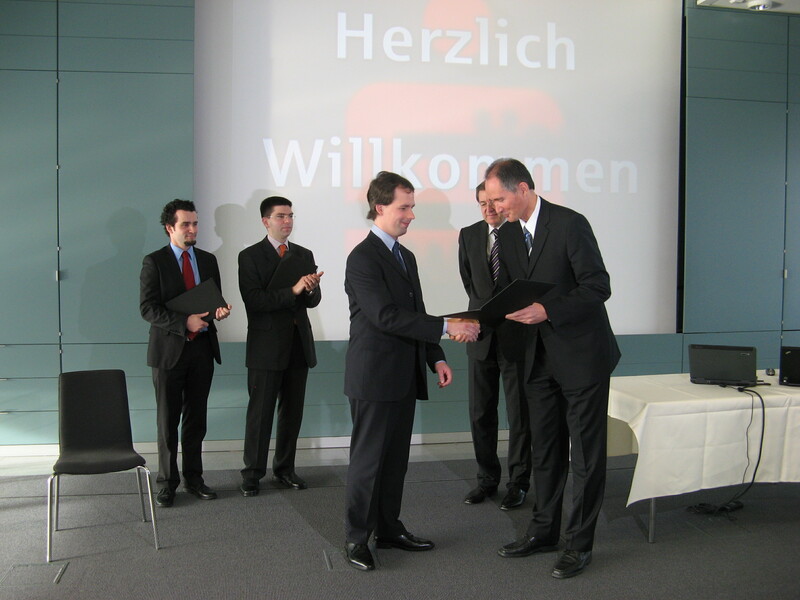 I have been awarded for my work on RSerPool with the award "Wissenschaftspreis der Sparkasse Essen". 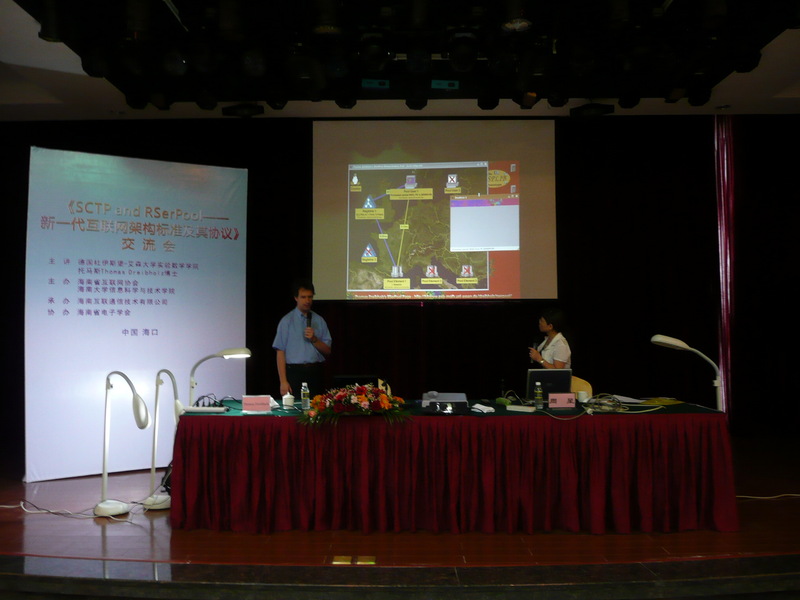 RSerPool/RSPLIB presentation to software developers and press in Haikou, Hainan/China. What is Reliable Server Pooling? The development and standardization of an application-independent server pooling architecture has been set as the goal of the IETF RSerPool WG. As a result, the working group has created their concept Reliable Server Pooling, abbreviated as RSerPool, which at the moment consists of eight RFCs, several Internet Drafts and our prototype RSPLIB as reference implementation. The RSerPool solution may not require a significant amount of resources (e.g. CPU power or memory). In particular, it should be possible to realize RSerPool-based systems also on low-power devices like mobile phones, PDAs and embedded devices. Real-time services like telephone signalling have very strict limitations on the duration of failovers. In the case of component failures, it may be necessary that a "normal" system state is re-established within a duration of just a few hundreds of milliseconds. In telephone signalling, such a feature is in particular crucial when dealing with emergency calls. Providing services like distributed computing, it is necessary to manage pools of many hundreds or even thousands of servers (e.g. animation rendering pools). The RSerPool architecture must be able to efficiently handle such pools. But the amount and size of pools are limited to a company or organization. In particular, it is not a goal of RSerPool to handle the global Internet in one pool set. It must be possible to easily adapt the RSerPool architecture to future applications. In particular, this means to have the possibility to add new server selection procedures. That is, new applications can define special rules on which server of the pool is the most appropriate to use for the processing of a request (e.g. the least-used server). The configuration effort of RSerPool components (e.g. adding or removing servers) should be as small as possible. In the ideal case, the configuration should happen automatically, i.e. it should e.g. only be necessary to turn on a new server and it will configure automatically. The figure above shows the building blocks of the RSerPool architecture, which has been defined by the IETF RSerPool WG in RFC 5351. In the terminology of RSerPool a server is denoted as a Pool Element (PE). In its Pool, it is identified by its Pool Element Identifier (PE ID), a 32-bit number. The PE ID is randomly chosen upon a PE's registration to its pool. The set of all pools is denoted as the Handlespace. In older literature, it may be denoted as Namespace. This denomination has been dropped in order to avoid confusion with the Domain Name System (DNS). Each pool in a handlespace is identified by a unique Pool Handle (PH), which is represented by an arbitrary byte vector. Usually, this is an ASCII or Unicode representation of the pool, e.g. "DownloadPool" or "WebServerPool". Each handlespace has a certain scope (e.g. an organization or company), which is denoted as Operation Scope. It is an explicit non-goal of RSerPool to manage the global Internet's pools within a single handlespace. Due to the limitation of operation scopes, it is possible to keep the handlespace "flat". That is, PHs do not have any hierarchy in contrast to the DNS with its top-level and sub-domains. This constraint results in a significant simplification of the handlespace management. Within an operation scope, the handlespace is managed by redundant Registrars. In literature, this component is also denoted as ENRP Server or Name Server. Since "registrar" is the most expressive term, this denotation is used here. PRs have to be redundant in order to avoid a PR to become a single point of failure (SPoF). Each PR of an operation scope is identified by its Registrar ID (PR ID), which is a 32-bit random number. It is not necessary to ensure uniqueness of PR IDs. A PR contains a complete copy of the operation scope's handlespace. PRs of an operation scope synchronize their view of the handlespace using the Endpoint HaNdlespace Redundancy Protocol (ENRP) defined in RFC 5353. Older versions of this protocol use the term Endpoint Namespace Redundancy Protocol; this naming has been replaced to avoid confusion with DNS, but the abbreviation has been kept. Due to handlespace synchronization by ENRP, PRs of an operation scope are functionally equal. That is, if any of the PRs fails, each other PR is able to seamlessly replace it. By using the Aggregate Server Access Protocol (ASAP), defined in RFC 5352, a PE can add itself to a pool or remove it from by requesting a registration or deregistration from an arbitrary PR of the operation scope. In case of successful registration, the PR chosen for registration becomes the PE's Home-PR (PR-H). A PR-H not only informs the other PRs of the operation scope about the registration or deregistration of its PEs, it also monitors the availability of its PEs by ASAP Keep-Alive messages. A keep-alive message by a PR-H has to be acknowledged by the PE within a certain time interval. If the PE fails to answer within a certain timeout, it is assumed to be dead and immediately removed from the handlespace. Furthermore, a PE is expected to re-register regularly. At a re-registration, it is also possible for the PE to change its list of transport addresses or its policy information (to be explained later). To use the service of a pool, a client – called Pool User (PU) in RSerPool terminology – first has to request the resolution of the pool's PH to a list of PE identities at an arbitrary PR of the operation scope. This selection procedure is denoted as Handle Resolution. For the case that the requested pool is existing, the PR will select a list of PE identities according to the pool's Pool Member Selection Policy, also simply denoted as Pool Policy. RFC 5356 defines some standard pool policies. Possible pool policies are e.g. a random selection (Random) or the least-loaded PE (Least Used). While in the first case it is not necessary to have any selection information (PEs are selected randomly), it is required to maintain up-to-date load information in the second case of selecting the least-loaded PE. By using an appropriate selection policy, it is e.g. possible to equally distribute the request load onto the pool's PEs. After reception of a list of PE identities from a PR, a PU will write the PE information into its local cache. This cache is denoted as PU-side Cache. Out of its cache, the PU will select exactly one PE – again by applying the pool's selection policy – and establish a connection to it by using the application's protocol, e.g. HTTP over SCTP or TCP in case of a web server. Over this connection, the service provided by the server can be used. For the case that the establishment of the connection fails or the connection is aborted during service usage, a new PE can be selected by repeating the described selection procedure. If the information in the PU-side cache is not outdated, a PE identity may be directly selected from cache, skipping the effort of asking a PR for handle resolution. After re-establishing a connection with a new PE, the state of the application session has to be re-instantiated on the new PE. The procedure necessary for session resumption is denoted as failover procedure and is of course application-specific. For an FTP download for example, the failover procedure could mean to tell the new FTP server the file name and the last received data position. By that, the FTP server will be able to resume the download session. Since the failover procedure is highly application-dependent, it is not part of RSerPool itself, though RSerPool provides far-reaching support for the implementation of arbitrary failover schemes by its Session Layer mechanisms. To make it possible for RSerPool components to configure automatically, PRs can announce themselves via UDP over IP multicast. These announces can be received by PEs, PUs and other PRs, allowing them to learn the list of PRs currently available in the operation scope. The advantage of using IP multicast instead of broadcast is that this mechanism will also work over routers (e.g. LANs connected via a VPN) and the announces will – for the case of e.g. a switched Ethernet – only be heard and processed by stations actually interested in this information. For the case that IP multicast is not available, it is of course possible to statically configure PR addresses. RSerPool is a completely new protocol framework. To make it possible for existing specialized or proprietary server pooling solutions to iteratively migrate to an RSerPool-based solution, it is mandatory to provide a migration path. For clients without support for RSerPool, the RSerPool concept provides the possibility of a Proxy PU (PPU). A PPU handles requests of non-RSerPool clients and provides an intermediation instance between them and the RSerPool-based server pool. From a PE's perspective, PPUs behave like regular PUs. Similar to a PPU allowing the usage of a non-RSerPool client, it is possible to use a Proxy PE (PPE) to continue using a non-RSerPool server in an RSerPool environment. The figure above shows the protocol stack of PR, PE and PU. The ENRP protocol is only used for the handlespace synchronization between PRs, all communications between PE and PR (registration, re-registration, deregistration, monitoring) and PU and PR (handle resolution, failure reporting) is based on the ASAP protocol. The failover support, based on an optional Session Layer between PU and PE, is also using ASAP. In this case, the ASAP protocol data (Control Channel) is multiplexed with the application protocol's data (Data Channel) over the same connection. By using the Session Layer functionality of ASAP, a pool can be viewed as a single, highly available server from the PU's Application Layer perspective. Failure detection and handling is mainly handled automatically in the Session Layer, transparent for the Application Layer. Protocol identification by Payload Protocol Identifier (PPID) for protocol multiplexing (required for the ASAP Session Layer functionality). For the transport of PR announces by ASAP and ENRP via IP multicast, UDP is used as transport protocol. The usage of SCTP is mandatory for all ENRP communication between PRs and the ASAP communication between PEs and PRs. For the ASAP communication between PU and PR and the Session Layer communication between PE and PU, it is recommended to use SCTP. However, the usage of TCP together with an adaptation layer defined in [draft-ietf-rserpool-tcpmapping] is possible. This adaptation layer adds functionalities like Heartbeats, message framing and protocol identification on top of a TCP connection. But nevertheless, some important advantages of SCTP are missing – especially the high immunity against flooding attacks and the multi-homing property. The only meaningful reason to use TCP is when the PU implementation cannot be equipped with an SCTP stack, e.g. when using a proprietary embedded system providing only a TCP stack. Watch an RSerPool/RSPLIB demonstration video here (Xvid codec required)! A screenshot of our fractal graphics demo application: two PEs provide a fractal graphics computation service, which is requested by two PUs. Dreibholz, Thomas: ``Applicability of Reliable Server Pooling for Real-Time Distributed Computing´´ (TXT, 19 KiB, ), Internet Draft draft-dreibholz-rserpool-applic-distcomp-26, IETF, Individual Submission, March 6, 2019, [BibTeX, XML]. Abstract: This document describes the applicability of the Reliable Server Pooling architecture to manage real-time distributed computing pools and access the resources of such pools. Dreibholz, Thomas and Pulinthanath, Jobin: ``Applicability of Reliable Server Pooling for SCTP-Based Endpoint Mobility´´ (TXT, 17 KiB, ), Internet Draft draft-dreibholz-rserpool-applic-mobility-25, IETF, Individual Submission, March 6, 2019, [BibTeX, XML]. Abstract: This document describes a novel mobility concept based on a combination of SCTP with Dynamic Address Reconfiguration extension and Reliable Server Pooling (RSerPool). Dreibholz, Thomas and Zhou, Xing: ``Definition of a Delay Measurement Infrastructure and Delay-Sensitive Least-Used Policy for Reliable Server Pooling´´ (TXT, 18 KiB, ), Internet Draft draft-dreibholz-rserpool-delay-23, IETF, Individual Submission, March 6, 2019, [BibTeX, XML]. Abstract: This document contains the definition of a delay measurement infrastructure and a delay-sensitive Least-Used policy for Reliable Server Pooling. Dreibholz, Thomas: ``Handle Resolution Option for ASAP´´ (TXT, 14 KiB, ), Internet Draft draft-dreibholz-rserpool-asap-hropt-24, IETF, Individual Submission, March 6, 2019, [BibTeX, XML]. Abstract: This document describes the Handle Resolution option for the ASAP protocol. Dreibholz, Thomas: ``Ideas for a Next Generation of the Reliable Server Pooling Framework´´ (TXT, 15 KiB, ), Internet Draft draft-dreibholz-rserpool-nextgen-ideas-11, IETF, Individual Submission, March 6, 2019, [BibTeX, XML]. Abstract: This document collects some idea for a next generation of the Reliable Server Pooling framework. Dreibholz, Thomas and Tüxen, Michael: ``Reliable Server Pooling (RSerPool) Bakeoff Scoring´´ (TXT, 20 KiB, ), Internet Draft draft-dreibholz-rserpool-score-24, IETF, Individual Submission, March 6, 2019, [BibTeX, XML]. Abstract: This memo describes some of the scoring to be used in the testing of Reliable Server Pooling protocols ASAP and ENRP at upcoming bakeoffs. Dreibholz, Thomas and Zhou, Xing: ``Takeover Suggestion Flag for the ENRP Handle Update Message´´ (TXT, 15 KiB, ), Internet Draft draft-dreibholz-rserpool-enrp-takeover-21, IETF, Individual Submission, March 6, 2019, [BibTeX, XML]. Abstract: This document describes the Takeover Suggestion Flag for the ENRP_HANDLE_UPDATE message of the ENRP protocol. Dreibholz, Thomas; Tüxen, Michael; Shore, Melinda and Zong, Ning: ``The Applicability of Reliable Server Pooling (RSerPool) for Virtual Network Function Resource Pooling (VNFPOOL)´´ (TXT, 36 KiB, ), Internet Draft draft-dreibholz-vnfpool-rserpool-applic-08, IETF, Individual Submission, February 1, 2019, [BibTeX, XML]. Dreibholz, Thomas; Coene, Lode and Conrad, Phillip T.: ``Reliable Server Pooling Applicability for IP Flow Information Exchange´´ (TXT, 16 KiB, ), Internet Draft draft-coene-rserpool-applic-ipfix-19, IETF, Individual Submission, March 5, 2018, [BibTeX, XML]. Abstract: This document describes the applicability of the Reliable Server Pooling architecture to the IP Flow Information Exchange using the Aggregate Server Access Protocol (ASAP) functionality of RSerPool only. Data exchange in IPFIX between the router and the data collector can be provided by a limited retransmission protocol. Dreibholz, Thomas: ``On the Applicability of Reliable Server Pooling for Virtualised Network Function Resource Pooling´´ (PDF, 2476 KiB, ), in Proceedings of the 89th IETF Meeting, London/United Kingdom, March 4, 2014, [BibTeX, XML]. Dreibholz, Thomas; Becke, Martin; Adhari, Hakim and Rathgeb, Erwin Paul: ``RspSim – A Simulation Model of the Reliable Server Pooling Framework´´ (PDF, 226 KiB, ), OMNeT++ Code Contribution, University of Duisburg-Essen, Institute for Experimental Mathematics, February 6, 2012, [BibTeX, XML]. Abstract: This code contribution paper provides an overview of the RSPSIM model, which is a simulation model for the Reliable Server Pooling (RSerPool) framework. RSerPool denotes an IETF standard for the management of server pools and sessions with these pools. Such mechanisms are also crucial in the context of cloud computing research. Dreibholz, Thomas: ``Server-Redundanz und Lastverteilung einfach in eigene Anwendungen integrieren – mit Reliable Server Pooling und RSPLIB´´ (PDF, 1309 KiB, ), in Proceedings of the LinuxTag, Berlin/Germany, May 12, 2011, [BibTeX, XML]. Abstract: RSPLIB ist die Open-Source-Implementierung von Reliable Server Pooling (RSerPool), dem noch sehr neuen IETF-Standard für Server-Redundanz und Sitzungsverwaltung. Dieser Artikel soll insbesondere zeigen, wie RSerPool mit RSPLIB in eigenen Anwendungen für Hochverfügbarkeit und Lastverteilung eingesetzt werden kann. Im Rahmen des Vortrags soll zudem eine Beispielanwendung in der Praxis demonstriert werden. Dreibholz, Thomas; Zhou, Xing; Becke, Martin; Pulinthanath, Jobin; Rathgeb, Erwin Paul and Du, Wencai: ``On the Security of Reliable Server Pooling Systems´´ (PDF, 540 KiB, ), in International Journal on Intelligent Information and Database Systems (IJIIDS), vol. 4, no. 6, pp. 552–578, DOI 10.1504/IJIIDS.2010.036894, ISSN 1751-5858, December 2010, [BibTeX, XML]. Abstract: In order to cope with the requirements of availability-critical Internet services, Reliable Server Pooling (RSerPool) has been developed as the new IETF standard for a lightweight server redundancy and session failover framework. While the service and pool management performance of RSerPool had already been the topic of various research papers, its security has not yet been widely examined. But security for availability-critical systems is crucial, since service outages – regardless of whether being caused by system failures or intentional Denial of Service (DoS) attacks – are not acceptable for the users of such systems. In this article, we first introduce RSerPool as well as the underlying SCTP protocol. In an analysis of the attack threats, we will show the possibilities of an attacker to degrade the service provided by an RSerPool system. We will furthermore introduce possible countermeasures, in order to prevent attacks and improve the robustness of the systems. We will finally show the effectiveness of our proposed countermeasures using simulations. In order to validate our simulation results, we furthermore compare them to measurements from a real-world Internet setup using the PlanetLab. Dreibholz, Thomas and Becke, Martin: ``The RSPLIB Project – From Research to Application´´ (PDF, 2105 KiB, ), Demo Presentation at the IEEE Global Communications Conference (GLOBECOM), Miami, Florida/U.S.A., December 8, 2010, [BibTeX, XML]. Abstract: The goal of the RSPLIB project has been to design and develop an Open Source implementation of Reliable Server Pooling (RSerPool), the new IETF framework for server pool and session management. While its original intention had been the research on RSerPool optimizations and protocol improvements, it has meanwhile become a production-ready platform which is already used by a couple of applications. In our proposed demo for the IEEE GLOBECOM 2010, we would like to introduce RSerPool and show how applications can benefit from using the features provided by RSPLIB. Zhou, Xing; Dreibholz, Thomas; Becke, Martin; Pulinthanath, Jobin; Rathgeb, Erwin Paul and Du, Wencai: ``The Software Modeling and Implementation of Reliable Server Pooling and RSPLIB´´ (PDF, 2764 KiB, ), in Proceedings of the 8th ACIS Conference on Software Engineering Research, Management and Applications (SERA), pp. 129–136, DOI 10.1109/SERA.2010.26, ISBN 978-0-7695-4075-7, Montréal, Québec/Canada, May 24, 2010, [BibTeX, XML]. Abstract: With the growing complexity of software applications, there is an increasing demand for solutions to distribute workload into server pools. Grid Computing provides powerful – but also highly complex – mechanisms to realize such tasks. Also, there is a steadily growing number of downtime-critical applications, requiring redundant servers to ensure service availability in case of component failures. To cope with the demand for server redundancy and service availability, the IETF has recently standardized the lightweight Reliable Server Pooling (RSerPool) framework, which is a common architecture for server pool and session management. In this paper, we first introduce the concept of RSerPool and then present the modeling thoughts of RSPLIB and the underlying general groupware design. Based on RSPLIB, we will illustratively show how to easily develop applications on top of RSerPool. We will also offer an application evaluation example for a proof-of-concept setup to distribute ray-tracing computation workload into a compute pool. Dreibholz, Thomas; Zhou, Xing; Rathgeb, Erwin Paul and Du, Wencai: ``A PlanetLab-Based Performance Analysis of RSerPool Security Mechanisms´´ (PDF, 721 KiB, ), in Proceedings of the 10th IEEE International Conference on Telecommunications (ConTEL), pp. 213–220, ISBN 978-953-184-131-3, Zagreb, Središnja Hrvatska/Croatia, June 8, 2009, [BibTeX, XML]. Abstract: Reliable Server Pooling (RSerPool) denotes the new IETF standard for a lightweight server redundancy and session failover framework for availability-critical applications. A number of research papers have already addressed the service and pool management performance of RSerPool in general. However, the important topic of security, including the system robustness against intentional attacks, has not yet been intensively addressed. In particular, none of the proposed Denial of Service (DoS) attack countermeasure mechanisms has been evaluated in a real-world Internet setup. For that reason, this paper provides an analysis of the robustness of RSerPool systems against DoS attacks. We will outline the DoS attack bandwidth which is necessary for a significant service degradation. Furthermore, we will present simple but effective DoS attack countermeasure mechanisms to significantly reduce the impact of attacks. Our analysis is based on a real-world Internet setup using the PlanetLab. We will furthermore compare the performance measurements against simulation results. Dreibholz, Thomas and Rathgeb, Erwin Paul: ``Overview and Evaluation of the Server Redundancy and Session Failover Mechanisms in the Reliable Server Pooling Framework´´ (PDF, 1157 KiB, ), in International Journal on Advances in Internet Technology (IJAIT), vol. 2, no. 1, pp. 1–14, ISSN 1942-2652, June 8, 2009, [BibTeX, XML]. Abstract: The number of availability-critical Internet applications is steadily increasing. To support the development and operation of such applications, the IETF has recently defined a new standard for a common server redundancy and session failover framework: Reliable Server Pooling (RSerPool). The basic ideas of the RSerPool framework are not entirely new, but their combination into a single, resource-efficient and unified architecture is. Service availability achieved by the redundancy of servers directly leads to the issues of load distribution and load balancing, which are both important for the performance of RSerPool systems. Therefore, it is crucial to evaluate the performance of such systems with respect to the load balancing strategy required by the service application. In this article – which is an extended version of our paper  – we first present an overview of the RSerPool architecture with a focus on the component failure detection and handling mechanisms. We will also shortly introduce the underlying SCTP protocol and its link redundancy features. After that, we will present a quantitative, application-independent performance analysis of the failure detection and session failover mechanisms provided by RSerPool, with respect to important adaptive and non-adaptive load balancing strategies. Zhou, Xing; Dreibholz, Thomas; Rathgeb, Erwin Paul and Du, Wencai: ``Takeover Suggestion – A Registrar Redundancy Handling Optimization for Reliable Server Pooling Systems´´ (PDF, 543 KiB, ), in Proceedings of the 10th IEEE/ACIS International Conference on Software Engineering, Artificial Intelligence, Networking and Parallel/Distributed Computing (SNPD), pp. 168–173, DOI 10.1109/SNPD.2009.17, ISBN 978-3-642-01202-0, Daegu/South Korea, May 27, 2009, [BibTeX, XML]. Abstract: Reliable Server Pooling (RSerPool) is the IETF&apos;s new standard for a common server redundancy and session failover framework to support availability-critical applications. Server pools are maintained by redundant management components denoted as registrars. These registrars monitor the availability of servers in the pool and remove them in case of failure. Furthermore, they synchronize their view of the pool with other registrars to provide information redundancy. In this paper, we first illustrate the implications of registrar redundancy on the performance of RSerPool systems. After that, we present an optimization approach for the server pool management, which improves the management performance in case of registrar problems like hardware failures or Denial of Service attacks. The performance of our approach is evaluated in real life using PlanetLab measurements. Zhou, Xing; Dreibholz, Thomas; Fu, Fa; Du, Wencai and Rathgeb, Erwin Paul: ``Evaluation and Optimization of the Registrar Redundancy Handling in Reliable Server Pooling Systems´´ (PDF, 484 KiB, ), in Proceedings of the IEEE 23rd International Conference on Advanced Information Networking and Applications (AINA), pp. 256–262, DOI 10.1109/AINA.2009.25, ISBN 978-0-7695-3638-5, Bradford, West Yorkshire/United Kingdom, May 26, 2009, [BibTeX, XML]. Abstract: The Reliable Server Pooling (RSerPool) architecture is the IETF&apos;s new standard for a lightweight server redundancy and session failover framework to support availability-critical applications. RSerPool combines the ideas from different research areas into a single, resource-efficient and unified architecture. Server pools are maintained by redundant management components, which are called registrars. Registrars monitor the availability of servers in the pool and remove them in case of failure. Furthermore, they synchronize their view of the pool with other registrars to provide information redundancy. In this paper, we first analyse the implications of registrar redundancy on the server pool performance. Furthermore, we present an optimization approach for the server pool management, which improves the system performance in case of registrar problems by hardware failures or Denial of Service attacks. Dreibholz, Thomas and Mulik, Jaiwant: ``Reliable Server Pooling MIB Module Definition´´ (TXT, 84 KiB, ), RFC 5525, IETF, DOI 10.17487/RFC5525, ISSN 2070-1721, April 22, 2009, [BibTeX, XML]. Abstract: Reliable Server Pooling (RSerPool) is a framework to provide reliable server pooling. The RSerPool framework consists of two protocols: ASAP (Aggregate Server Access Protocol) and ENRP (Endpoint Handlespace Redundancy Protocol). This document defines an SMIv2-compliant (Structure of Management Information Version 2) Management Information Base (MIB) module providing access to managed objects in an RSerPool implementation. This memo defines an Experimental Protocol for the Internet community. Dreibholz, Thomas; Zhou, Xing and Rathgeb, Erwin Paul: ``SimProcTC – The Design and Realization of a Powerful Tool-Chain for OMNeT++ Simulations´´ (PDF, 552 KiB, ), in Proceedings of the 2nd ACM/ICST International Workshop on OMNeT++, pp. 1–8, DOI 10.4108/ICST.SIMUTOOLS2009.5517, ISBN 978-963-9799-45-5, Rome/Italy, March 6, 2009, [BibTeX, XML]. Abstract: In this paper, we introduce our Open Source simulation tool-chain for OMNeT++ simulations: SimProcTC. This model-independent tool-chain has been designed to perform the common and frequently recurring tasks of simulation work – which are the parametrization of runs, the distributed run processing and the results visualization – in an efficient and easy to use manner. It is already successfully deployed for several OMNeT++-based research projects. Zhou, Xing; Dreibholz, Thomas; Du, Wencai and Rathgeb, Erwin Paul: ``Evaluation of Attack Countermeasures to Improve the DoS Robustness of RSerPool Systems by Simulations and Measurements´´ (PDF, 471 KiB, ), in Proceedings of the 16. ITG/GI Fachtagung Kommunikation in Verteilten Systemen (KiVS), Informatik aktuell, pp. 217–228, Springer, DOI 10.1007/978-3-540-92666-5_18, ISBN 978-3-540-92665-8, Kassel, Hessen/Germany, March 5, 2009, [BibTeX, XML]. Abstract: The Reliable Server Pooling (RSerPool) architecture is the IETF&apos;s new standard for a lightweight server redundancy and session failover framework to support availability-critical applications. RSerPool combines the ideas from different research areas into a single, resource-efficient and unified architecture. While there have already been a number of research papers on its performance in general, the robustness against intentional attacks has not been intensively addressed yet. In particular, there have not been any analyses for real setups. Therefore, the goal of this paper is to provide a robustness analysis in order to outline the attack bandwidth which is necessary for a significant impact on RSerPool-based services. This analysis is based on lab measurements – using a real RSerPool system setup – as well as on measurements for comparison and validation. Furthermore, we present and evaluate countermeasure approaches to significantly reduce the impact of attacks. Dreibholz, Thomas and Rathgeb, Erwin Paul: ``Towards the Future Internet – An Overview of Challenges and Solutions in Research and Standardization´´ (PDF, 1643 KiB, ), in Proceedings of the 2nd GI/ITG KuVS Workshop on the Future Internet, Karlsruhe, Baden-Württemberg/Germany, November 11, 2008, [BibTeX, XML]. Abstract: The basic intention for the development of the Internet has been the simple and inexpensive interconnection of nodes to provide services like file download or e-mail. However, due to its huge growth and popularity, the classical protocols – which still constitute the basis of today&apos;s Internet – have reached their limits of scalability and functionality. Lots of research has been performed in order to overcome these restrictions. In our presentation, we would like to give a survey of the challenges on Network, Transport, Session and Application Layer, as well as an outline of solutions which will constitute – from the current perspective in 2008 and with regard to the standardization progress of the IETF – the basis of the Internet in the year 2020. Schöttle, Pascal; Dreibholz, Thomas and Rathgeb, Erwin Paul: ``On the Application of Anomaly Detection in Reliable Server Pooling Systems for Improved Robustness against Denial of Service Attacks´´ (PDF, 563 KiB, ), in Proceedings of the 33rd IEEE Conference on Local Computer Networks (LCN), pp. 207–214, DOI 10.1109/LCN.2008.4664171, ISBN 978-1-4244-2413-9, Montréal, Québec/Canada, October 16, 2008, [BibTeX, XML]. Abstract: The Reliable Server Pooling (RSerPool) architecture is the IETF&apos;s upcoming standard of a light-weight server redundancy and session failover framework for availability-critical applications. RSerPool combines the ideas from different research areas into a single, resource-efficient and unified architecture. Although there have already been a number of research papers on the pool management, load distribution and failover handling performance of RSerPool, the robustness against intentional attacks has not been intensively addressed yet. Therefore, the first goal of this paper is to provide a robustness analysis in order to outline the attack bandwidth necessary for a significant impact on RSerPool-based services. After that, we present our anomaly detection approach that has been designed to protect RSerPool systems against attacks. We also show the effectiveness of this approach by simulations. Lei, Peter; Ong, Lyndon; Tüxen, Michael and Dreibholz, Thomas: ``An Overview of Reliable Server Pooling Protocols´´ (TXT, 33 KiB, ), Informational RFC 5351, IETF, DOI 10.17487/RFC5351, ISSN 2070-1721, September 30, 2008, [BibTeX, XML]. Abstract: The Reliable Server Pooling effort (abbreviated "RSerPool") provides an application-independent set of services and protocols for building fault-tolerant and highly available client/server applications. This document provides an overview of the protocols and mechanisms in the Reliable Server Pooling suite. This memo provides information for the Internet community. Dreibholz, Thomas and Tüxen, Michael: ``Reliable Server Pooling Policies´´ (TXT, 33 KiB, ), RFC 5356, IETF, DOI 10.17487/RFC5356, ISSN 2070-1721, September 30, 2008, [BibTeX, XML]. Abstract: This document describes server pool policies for Reliable Server Pooling (RSerPool) including considerations for implementing them at Endpoint Handlespace Redundancy Protocol (ENRP) servers and pool users. This memo defines an Experimental Protocol for the Internet community. 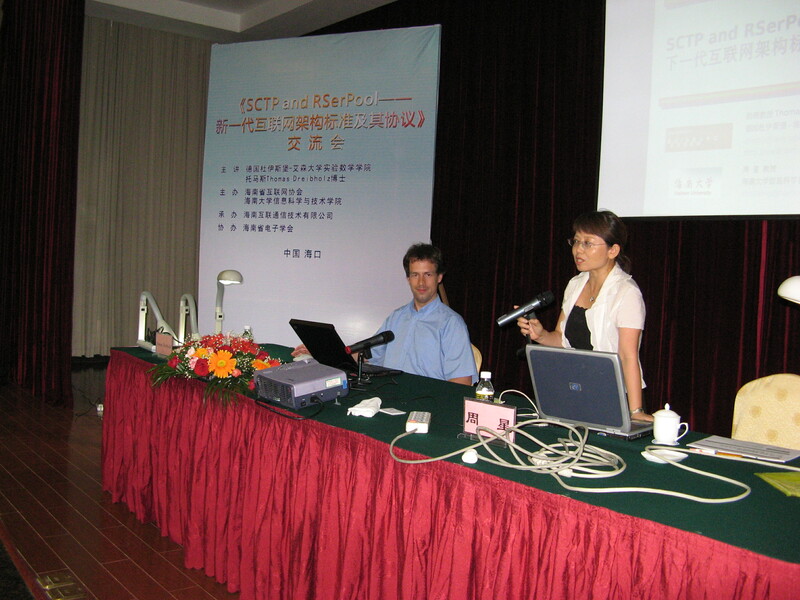 Dreibholz, Thomas and Zhou, Xing: ``SCTP and RSerPool: Architectures and Protocols for the Future Internet´´ (PDF, 2256 KiB, ), Invited Talk at Hainan University, College of Information Science and Technology (CIST), Haikou, Hainan/People&apos;s Republic of China, September 26, 2008, [BibTeX, XML]. Dreibholz, Thomas; Rathgeb, Erwin Paul and Zhou, Xing: ``On Robustness and Countermeasures of Reliable Server Pooling Systems against Denial of Service Attacks´´ (PDF, 479 KiB, ), in Proceedings of the 7th International IFIP Networking Conference, Lecture Notes in Computer Science, vol. 4982, pp. 586–598, Springer, DOI 10.1007/978-3-540-79549-0_51, ISBN 978-3-540-79548-3, Singapore, May 7, 2008, [BibTeX, XML]. Abstract: The Reliable Server Pooling (RSerPool) architecture is the IETF&apos;s novel approach to standardize a light-weight protocol framework for server redundancy and session failover. It combines ideas from different research areas into a single, resource-efficient and unified architecture. While there have already been a number of contributions on the performance of RSerPool for its main tasks – pool management, load distribution and failover handling – the robustness of the protocol framework has not yet been evaluated against intentional attacks. The first goal of this paper is to provide a robustness analysis. In particular, we would like to outline the attack bandwidth necessary for a significant impact on the service. Furthermore, we present and evaluate our countermeasure approach to significantly reduce the impact of attacks. Dreibholz, Thomas and Rathgeb, Erwin Paul: ``An Evaluation of the Pool Maintenance Overhead in Reliable Server Pooling Systems´´ (PDF, 3289 KiB, ), in SERSC International Journal on Hybrid Information Technology (IJHIT), vol. 1, no. 2, pp. 17–32, ISSN 1738-9968, April 2008, [BibTeX, XML]. Abstract: Currently, the IETF RSerPool WG is standardizing a generic protocol framework for server redundancy and session failover: Reliable Server Pooling (RSerPool). An important property of RSerPool is its lightweight architecture: server pool and session management can be realized with small CPU power and memory requirements. That is, RSerPool-based services can also be managed and provided by embedded systems. Up to now, there has already been some research on the performance of the data structures managing server pools. But a generic, application-independent performance analysis – in particular also including measurements in real system setups – is still missing. The aim of this article is therefore – after giving an outline of the RSerPool framework, an introduction to the pool management procedures and a description of our pool management approach – to first provide a detailed performance evaluation of the pool management structures themselves. Afterwards, the performance of a prototype implementation is analysed in order to evaluate its applicability in a real network setup. Dreibholz, Thomas and Rathgeb, Erwin Paul: ``A Powerful Tool-Chain for Setup, Distributed Processing, Analysis and Debugging of OMNeT++ Simulations´´ (PDF, 558 KiB, ), in Proceedings of the 1st ACM/ICST International Workshop on OMNeT++, DOI 10.4108/ICST.SIMUTOOLS2008.2990, ISBN 978-963-9799-20-2, Marseille, Bouches-du-Rhône/France, March 7, 2008, [BibTeX, XML]. Abstract: In this paper, we introduce our Open Source tool-chain providing the parametrization, distributed execution, results post-processing and debugging for OMNeT++-based simulations. While the initial motivation of these tools has been the support of our simulation model of the Reliable Server Pooling (RSerPool) framework, it has been particularly designed with model-independence in mind. That is, it can be easily adapted to other simulation models and therefore may be useful for other users of OMNeT++-based simulation models as well. Zhou, Xing; Dreibholz, Thomas and Rathgeb, Erwin Paul: ``A New Server Selection Strategy for Reliable Server Pooling in Widely Distributed Environments´´ (PDF, 444 KiB, ), in Proceedings of the 2nd IEEE International Conference on Digital Society (ICDS), pp. 171–177, DOI 10.1109/ICDS.2008.12, ISBN 978-0-7695-3087-1, Sainte Luce/Martinique, February 14, 2008, [BibTeX, XML]. Abstract: In order to provide a generic, application-independent and resource-efficient framework for server redundancy and session failover, the IETF RSerPool WG is currently standardizing the Reliable Server Pooling (RSerPool) framework. Server redundancy has to take load distribution and load balancing into consideration since these issues are crucial for the system performance. There has already been some research on the server selection strategies of RSerPool for different application scenarios. In particular, it has been shown that the adaptive Least Used selection usually provides the best performance. This strategy requires up-to-date load information of the services, which has to be propagated among distributed pool management components. But network delay (which is realistic for systems being widely distributed to achieve availability in case of regional servers failures) as well as caching of information may both lead to obsolete load information. Therefore, the purpose of this paper is to analyse and evaluate the performance of a new server selection rule to cope with update latencies. Especially, we will also analyse the impact of different workload parameters on the performance of the new server selection strategy. Dreibholz, Thomas and Rathgeb, Erwin Paul: ``Reliable Server Pooling – A Novel IETF Architecture for Availability-Sensitive Services´´ (PDF, 504 KiB, ), in Proceedings of the 2nd IEEE International Conference on Digital Society (ICDS), pp. 150–156, DOI 10.1109/ICDS.2008.11, ISBN 978-0-7695-3087-1, Sainte Luce/Martinique, February 14, 2008, [BibTeX, XML]. Awarded with the Best Paper Award. Abstract: Reliable Server Pooling (RSerPool) is a light-weight protocol framework for server redundancy and session failover, currently still under standardization by the IETF RSerPool WG. While the basic ideas of RSerPool are not new, their combination into a single, resource-efficient and unified architecture is. Server redundancy directly leads to the issues of load distribution and load balancing, which are both important for the performance of RSerPool systems. Therefore, it is crucial to evaluate the performance of such systems with respect to the load balancing strategy required by the application. The goal of our paper is – after presenting a short overview of the RSerPool architecture and its application cases – to provide a quantitative, application-independent performance analysis of RSerPool&apos;s server failure handling capabilities with respect to important adaptive and non-adaptive load balancing strategies. We will also analyse the impact of RSerPool protocol parameters on the performance of the server failure handling functionalities and the network overhead. Zhou, Xing; Dreibholz, Thomas and Rathgeb, Erwin Paul: ``A New Approach of Performance Improvement for Server Selection in Reliable Server Pooling Systems´´ (PDF, 10141 KiB, ), in Proceedings of the 15th IEEE International Conference on Advanced Computing and Communication (ADCOM), pp. 117–121, DOI 10.1109/ADCOM.2007.19, ISBN 0-7695-3059-1, Guwahati/India, December 19, 2007, [BibTeX, XML]. Abstract: Reliable Server Pooling (RSerPool) is a light-weight protocol framework for server redundancy and session failover, currently still under standardization by the IETF RSerPool WG. While the basic ideas of RSerPool are not completely new, their combination into a single, resource-efficient and unified architecture is. Server redundancy directly leads to the issues of load distribution and load balancing, which are both important for the performance of RSerPool systems. While there has already been some research on the server selection policies of RSerPool, an interesting question still remains open: Is it possible to further improve the load balancing performance of certain policies by simply letting servers reject inappropriately scheduled requests? In this case, the failover handling mechanisms of RSerPool could choose a possibly better server instead. The purpose of this paper is, after presenting an outline of the RSerPool framework, to analyse and evaluate the performance of our new approach. In particular, we will also analyse the impact of RSerPool protocol parameters on the performance of the server selection functionalities as well as on the overhead. Zhou, Xing; Dreibholz, Thomas and Rathgeb, Erwin Paul: ``Evaluation of a Simple Load Balancing Improvement for Reliable Server Pooling with Heterogeneous Server Pools´´ (PDF, 456 KiB, ), in Proceedings of the IEEE International Conference on Future Generation Communication and Networking (FGCN), vol. 1, pp. 173–180, DOI 10.1109/FGCN.2007.119, ISBN 0-7695-3048-6, Jeju Island/South Korea, December 8, 2007, [BibTeX, XML]. Abstract: The IETF is currently standardizing a light-weight protocol framework for server redundancy and session failover: Reliable Server Pooling (RSerPool). It is the novel combination of ideas from different research areas into a single, resource-efficient and unified architecture. Server redundancy directly leads to the issues of load distribution and load balancing. Both are important and have to be considered for the performance of RSerPool systems. While there has already been some research on the server selection policies of RSerPool, an interesting question is still open: Is it possible to further improve the load balancing performance of the standard policies without modifying the policies – which are well-known and widely supported – themselves? Our approach places its focus on the session layer rather than the policies and simply lets servers reject inappropriately scheduled requests. Applying failover handling mechanisms of RSerPool, in this case, could choose a more appropriate server instead. In , we have already shown that our approach is useful for homogeneous server pools. But is it also useful for heterogeneous pools? In this paper, we first present a short outline of the RSerPool framework. Afterwards, we analyse and evaluate the performance of our new approach for different server capacity distributions. Especially, we are also going to analyse the impact of RSerPool protocol and system parameters on the performance of the server selection functionalities as well as on the overhead. Dreibholz, Thomas and Rathgeb, Erwin Paul: ``An Evaluation of the Pool Maintenance Overhead in Reliable Server Pooling Systems´´ (PDF, 482 KiB, ), in Proceedings of the IEEE International Conference on Future Generation Communication and Networking (FGCN), vol. 1, pp. 136–143, DOI 10.1109/FGCN.2007.62, ISBN 0-7695-3048-6, Jeju Island/South Korea, December 6, 2007, [BibTeX, XML]. Abstract: Reliable Server Pooling (RSerPool) is a protocol framework for server redundancy and session failover, currently still under standardization by the IETF RSerPool WG. An important property of RSerPool is its lightweight architecture: server pool and session management can be realized with small CPU power and memory requirements. That is, RSerPool-based services can also be managed and provided by embedded systems. Currently, there has already been some research on the performance of the data structures managing server pools. But a generic, application-independent performance analysis – in particular also including measurements in real system setups – is still missing. Therefore, the aim of this paper is – after an outline of the RSerPool framework, an introduction to the pool management procedures and a description of our pool management approach – to first provide a detailed performance evaluation of the pool management structures themselves. Afterwards, the performance of a prototype implementation is analysed in order to evaluate its applicability under real network conditions. 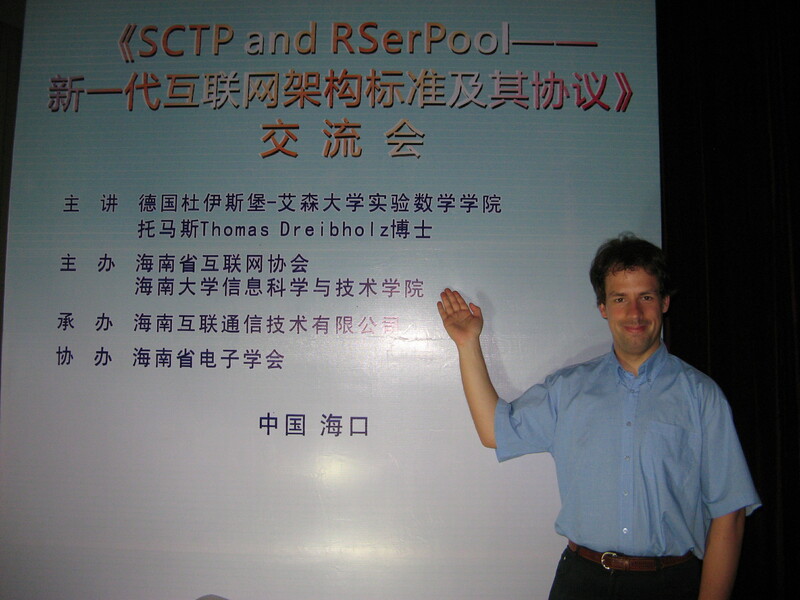 Dreibholz, Thomas: ``An Introduction to Reliable Server Pooling and the RSPLIB Implementation´´ (PDF, 7736 KiB, ), Invited Talk at Hainan University, College of Information Science and Technology (CIST), Haikou, Hainan/People&apos;s Republic of China, December 2, 2007, [BibTeX, XML]. Zhou, Xing; Dreibholz, Thomas and Rathgeb, Erwin Paul: ``Improving the Load Balancing Performance of Reliable Server Pooling in Heterogeneous Capacity Environments´´ (PDF, 408 KiB, ), in Proceedings of the 3rd Asian Internet Engineering Conference (AINTEC), Lecture Notes in Computer Science, vol. 4866, pp. 125–140, Springer, DOI 10.1007/978-3-540-76809-8_12, ISBN 978-3-540-76808-1, November 28, 2007, [BibTeX, XML]. Abstract: The IETF is currently standardizing a light-weight protocol framework for server redundancy and session failover: Reliable Server Pooling (RSerPool). It is the novel combination of ideas from different research areas into a single, resource-efficient and unified architecture. Server redundancy directly leads to the issues of load distribution and load balancing. Both are important and have to be considered for the performance of RSerPool systems. While there has already been some research on the server selection policies of RSerPool, an interesting question is still open: Is it possible to further improve the load balancing performance of the standard policies without modifying the policies – which are well-known and widely supported – themselves? Our approach places its focus on the session layer rather than the policies and simply lets servers reject inappropriately scheduled requests. But is this approach useful – in particular if the server capacities increase in terms of a heterogeneous capacity distribution? Applying failover handling mechanisms of RSerPool, in this case, could choose a more appropriate server instead. In this paper, we first present a short outline of the RSerPool framework. Afterwards, we analyse and evaluate the performance of our new approach for different server capacity distributions. Especially, we are also going to analyse the impact of RSerPool protocol and system parameters on the performance of the server selection functionalities as well as on the overhead. Dreibholz, Thomas: ``Hochverfügbarkeit mit Reliable Server Pooling´´ (PDF, 7740 KiB, ), in Proceedings of the Linuxtage in Essen, Essen, Nordrhein-Westfalen/Germany, November 10, 2007, [BibTeX, XML]. Abstract: Mit der ständig wachsenden Verbreitung von Internetzugängen nimmt auch die Anzahl an verfügbarkeits-kritischen Diensten im Netz zu. Ausfälle von z.B. VoIP-Vermittlungsanlagen zur Weiterleitung von Notrufen oder e-Commerce-Anwendungen sind nicht akzeptabel. Zur Sicherstellung der Verfügbarkeit von Diensten bei Geräte- und Netzwerkausfällen müssen diese Komponenten redundant ausgelegt sein. Spezialisierte Redundanzlösungen – insbesondere z.B. für Web-Server – gibt es zwar viele, eine einheitliche, für viele Dienste nutzbare Lösung fehlte jedoch noch. Reliable Server Pooling, abgekürzt RSerPool, ist ein Rahmenwerk zur Bereitstellung hochverfügbarer Anwendungen durch redundante Server, es befindet sich zur Zeit in der Standardisierung durch die IETF RSerPool-Arbeitsgruppe. Im RSerPool-Konzept werden Server, welche den gleichen Dienst anbieten, zu einem Pool zusammengefaßt. Neben der Hauptaufgabe – der Verfügbarkeit von Diensten – ist insbesondere auch die Lastverteilung ein wichtiges Anwendungsgebiet von RSerPool. Im Rahmen eines Forschungsprojektes haben wir – die Arbeitsgruppe Technik der Rechnernetze am Institut für Experimentelle Mathematik der Universität Duisburg-Essen – im Jahre 2002 damit begonnen, einen plattformunabhängigen RSerPool-Prototypen als Open Source unter GPL-Lizenz zu entwickeln. Mittlerweile wird unser Projekt durch die Deutsche Forschungsgemeinschaft (DFG) gefördert. Unser System läuft zur Zeit unter Linux, FreeBSD, Darwin (MacOS X) und Solaris, wobei die Unterstützung für weitere Plattformen – insbesondere auch für Embedded-Systeme – geplant ist. Als einzige vollständige Implementierung des zukünftigen RSerPool-Standards sind wir Referenzimplementierung der IETF RSerPool-Arbeitsgruppe und wirken mit Tests und Forschungsarbeiten aktiv in der Standardisierung mit. In unserem Vortrag geben wir zunächst eine kurze Einführung zu RSerPool. Dabei wollen wir insbesondere auch die Merkmale verdeutlichen, die RSerPool von existierenden Lösungen – wie Linux Virtual Server (LVS) oder dem kommerziellen Cisco Distributed Director – unterscheiden. Außerdem wollen wir zeigen, welche speziellen Funktionalitäten RSerPool bietet um den Nutzen eines Serverpools sowohl für dessen Betreiber als auch für den Anwender zu optimieren: die Möglichkeit zur vollautomatischen Konfiguration von Komponenten und die Festlegung pool-spezifischer Serverauswahlregeln. Diese Funktionalitäten werden wir am Beispiel einer Anwendung von RSerPool für Real-Time Distributed Computing verdeutlichen. Im zweiten Teil unseres Vortrags werden wir auf unsere Open Source Implementierung rsplib eingehen. Neben dem Aufbau der einzelnen Komponenten werden wir insbesondere auch interessante Details der Implementierung vorstellen und beschreiben, wie wir auftretende Probleme erfolgreich lösen konnten. Insbesondere wollen wir dabei auch unsere gesammelten Erfahrungen beim Erstellen von auf unterschiedlichen Betriebssystemen (Linux, FreeBSD, MacOS X, Solaris) und Hardware (x86, x64, PPC) lauffähiger Software vorstellen. Im Anschluß daran zeigen wir, wie das RSerPool-API dazu genutzt werden kann, eigene Anwendungen hochverfügbar zu machen und die Möglichkeiten zur Lastverteilung im Pool verwendet werden können. Ein Schwerpunkt dieser Einführung wird dabei insbesondere die einfache und effiziente Realisierung des Failover-Mechanisms sein, d.h. des Verfahrens zur Wiederherstellung eines Sitzungszustandes auf einem neuen Server nach Ausfall des alten. Im Besonderen werden wir dabei zeigen, welche Fähigkeiten RSerPool und sein API mitbringen um dieses – teilweise recht komplexe Thema – in vielen Fällen übersichtlich und mit wenigen Zeilen Programmcode zu lösen: Hochverfügbarkeit für eigene Anwendungen muß nicht kompliziert sein! Zum Abschluß stellen wir noch unsere Beispielanwendung vor, ein System zum verteilten Berechnen von Fraktalgrafiken. Mit diesem System lassen sich die grundlegenden Eigenschaften von RSerPool – welche im Vortrag vorgestellt wurden – sehr anschaulich demonstrieren: die Verwaltung dynamischer Pools, Lastverteilung und Failover bei Serverausfall. Selbstverständlich werden wir unser Beispielsystem beim Vortrag auch in der Praxis demonstrieren, bei Vorhandensein eines Internetzugangs sogar mit einem Szenario aus weltweit verteilten Ressourcen. Dreibholz, Thomas; Zhou, Xing and Rathgeb, Erwin Paul: ``A Performance Evaluation of RSerPool Server Selection Policies in Varying Heterogeneous Capacity Scenarios´´ (PDF, 383 KiB, ), in Proceedings of the 33rd IEEE EuroMirco Conference on Software Engineering and Advanced Applications, pp. 157–164, DOI 10.1109/EUROMICRO.2007.9, ISBN 0-7695-2977-1, Lübeck, Schleswig-Holstein/Germany, August 29, 2007, [BibTeX, XML]. Abstract: Reliable Server Pooling (RSerPool) is a protocol framework for server redundancy and session failover, currently still under standardization by the IETF RSerPool WG. Server redundancy influences load distribution and load balancing, which both are important for the performance of RSerPool systems. Especially, a good load balancing strategy is crucial if the servers of a pool are heterogeneous. Some research on this subject has already been performed, but a detailed analysis on the question of how to make best use of additional capacity in dynamic pools is still open. Therefore, the aim of this paper is, after an outline of the RSerPool framework, to simulatively examine the performance of RSerPool server selection strategies in scenarios of pools with varying server heterogeneity. In particular, this paper examines and evaluates a simple but very effective new policy, achieving a significant performance improvement in such situations. Dreibholz, Thomas and Rathgeb, Erwin Paul: ``Towards the Future Internet – A Survey of Challenges and Solutions in Research and Standardization´´ (PDF, 1669 KiB, ), in Proceedings of the 7th Joint EuroFGI and ITG Workshop on Visions of Future Network Generations (EuroView), Würzburg, Bayern/Germany, Poster Presentation, July 23, 2007, [BibTeX, XML]. Abstract: The basic intention for the development of the Internet has been the simple and inexpensive interconnection of nodes to provide services like file download or e-mail. However, due to its huge growth and popularity, the classical protocols – which still constitute the basis of today&apos;s Internet – have reached their limits of scalability and functionality. Lots of research has been performed in order to overcome these restrictions. On our poster, we would like to give a survey of the challenges on Network, Transport, Session and Application Layer, as well as an outline of solutions which will constitute – from the current perspective in 2007 and with regard to the standardization progress of the IETF – the basis of the Internet in 2022. Dreibholz, Thomas: ``Reliable Server Pooling – Evaluation, Optimization and Extension of a Novel IETF Architecture´´ (PDF, 9080 KiB, ), Ph.D. Dissertation, University of Duisburg-Essen, Faculty of Economics, Institute for Computer Science and Business Information Systems, URN urn:nbn:de:hbz:465-20070308-164527-0, March 7, 2007, [BibTeX, XML]. 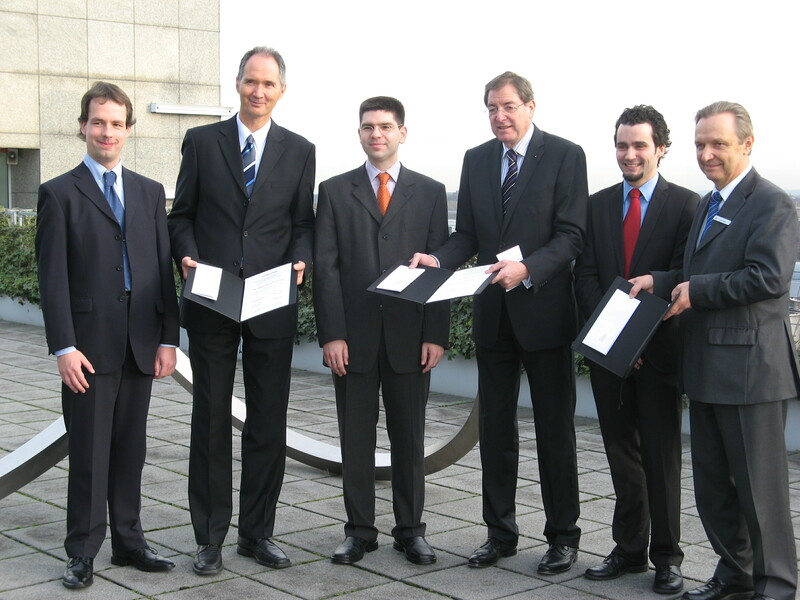 Awarded with the Science Award of the Sparkasse Essen. Abstract: The Reliable Server Pooling (RSerPool) architecture currently under standardization by the IETF RSerPool Working Group is an overlay network framework to provide server replication and session failover capabilities to applications using it. These functionalities as such are not new, but their combination into one generic, application-independent framework is. Initial goal of this thesis is to gain insight into the complex RSerPool mechanisms by performing experimental and simulative proof-of-concept tests. The further goals are to systematically validate the RSerPool architecture and its protocols, provide improvements and optimizations where necessary and propose extensions if useful. Based on these evaluations, recommendations to implementers and users of RSerPool should be provided, giving guidelines for the tuning of system parameters and the appropriate configuration of application scenarios. In particular, it is also a goal to transfer insights, optimizations and extensions of the RSerPool protocols from simulation to reality and also to bring the achievements from research into application by supporting and contributing relevant results to the IETF&apos;s ongoing RSerPool standardization process. To achieve the described goals, a prototype implementation as well as a simulation model are designed and realized at first. Using a generic application model and appropriate performance metrics, the performance of RSerPool systems in failure-free and server failure scenarios is systematically evaluated in order to identify critical parameter ranges and problematic protocol behaviour. Improvements developed as result of these performance analyses are evaluated and finally contributed into the standardization process of RSerPool. Dreibholz, Thomas and Rathgeb, Erwin Paul: ``On Improving the Performance of Reliable Server Pooling Systems for Distance-Sensitive Distributed Applications´´ (PDF, 393 KiB, ), in Proceedings of the 15. ITG/GI Fachtagung Kommunikation in Verteilten Systemen (KiVS), Informatik aktuell, pp. 39–50, Springer, DOI 10.1007/978-3-540-69962-0_4, ISBN 978-3-540-69962-0, Bern/Switzerland, February 28, 2007, [BibTeX, XML]. Abstract: Reliable Server Pooling (RSerPool) is a protocol framework for server redundancy and session failover, currently under standardization by the IETF RSerPool WG. While the basic ideas of RSerPool are not new, their combination into a single, unified architecture is. Server pooling becomes increasingly important, because there is a growing amount of availability-critical applications. For a service to survive localized disasters, it is useful to place the servers of a pool at different locations. However, the current version of RSerPool does not incorporate the aspect of component distances in its server selection decisions. In our paper, we present an approach to add distance-awareness to the RSerPool architecture, based on features of the SCTP transport protocol. This approach is examined and evaluated by simulations. But to also show its usefulness in real life, we furthermore validate our proposed extension by measurements in a PlanetLab-based Internet scenario. Dreibholz, Thomas: ``RSPLIB – Eine Open Source Implementation von Reliable Server Pooling´´ (PDF, 7868 KiB, ), in Proceedings of the Linuxtage in Essen, Essen, Nordrhein-Westfalen/Germany, September 9, 2006, [BibTeX, XML]. Abstract: In unserem Vortrag geben wir zunächst eine kurze Einführung zu RSerPool. Dabei wollen wir insbesondere auch die Merkmale verdeutlichen, die RSerPool von existierenden Lösungen – wie Linux Virtual Server (LVS) oder dem kommerziellen Cisco Distributed Director – unterscheiden. Außerdem wollen wir vorstellen, welche speziellen Funktionalitäten RSerPool bietet um den Nutzen eines Serverpools sowohl für dessen Betreiber als auch für den Anwender zu optimieren: die Möglichkeit zur vollautomatischen Konfiguration von Komponenten und die Festlegung pool-spezifischer Serverauswahlregeln. Diese Funktionalitäten werden wir am Beispiel der Anwendung von RSerPool für Real-Time Distributed Computing verdeutlichen. Im zweiten Teil unseres Vortrages werden wir auf unsere Open Source Implementation rsplib eingehen. Neben dem Aufbau der einzelnen Komponenten werden wir insbesondere auch interessante Details der Implementation vorstellen und beschreiben, wie wir auftretende Probleme erfolgreich lösen konnten. Insbesondere wollen wir dabei auch unsere gesammelten Erfahrungen beim Erstellen von auf unterschiedlichen Betriebssystemen und Hardware lauffähiger Software vorstellen. Im Anschluß daran wenden wir uns kurz dem API der rsplib zu und zeigen, wie eigene Programme mit dessen Hilfe hochverfügbar gemacht werden können. Neben neuer, direkt auf RSerPool basierender Software, berücksichtigen wir dabei insbesondere auch die Anpassung bestehender Applikationen und stellen Möglichkeiten zur Migration vor. Zum besseren Verständnis werden sämtliche Beschreibungen von Code-Beispielen begleitet. Zum Abschluß stellen wir noch unsere Beispielanwendung vor, ein System zum verteilten Berechnen von Fraktalgrafiken. Mit diesem System lassen sich die grundlegenden Eigenschaften von RSerPool – welche im ersten Teil des Vortrages vorgestellt wurden – sehr anschaulich demonstrieren: die Verwaltung dynamischer Pools, Lastverteilung und Failover bei PE-Ausfall. Selbstverständlich werden wir unser Beispielsystem beim Vortrag auch praktisch demonstrieren. Dreibholz, Thomas and Rathgeb, Erwin Paul: ``The Performance of Reliable Server Pooling Systems in Different Server Capacity Scenarios´´ (PDF, 679 KiB, ), in Proceedings of the IEEE TENCON, DOI 10.1109/TENCON.2005.300939, ISBN 0-7803-9312-0, Melbourne, Victoria/Australia, November 22, 2005, [BibTeX, XML]. Abstract: Reliable Server Pooling (RSerPool) is a protocol framework for server pool management and session failover, currently under standardization by the IETF RSerPool WG. While the basic ideas of RSerPool are not new, their combination into one architecture is. Some research into the performance of RSerPool for certain specific applications has been made, but a detailed, application-independent sensitivity analysis of the system parameters is still missing. The goal of this paper is to systematically investigate RSerPool&apos;s load distribution behaviour on changes of workload and system parameters, to determine basic guidelines on designing efficient RSerPool systems. In this paper, we focus particularly on scenarios of server pools consisting of servers with unequal capacities. Dreibholz, Thomas and Rathgeb, Erwin Paul: ``On the Performance of Reliable Server Pooling Systems´´ (PDF, 673 KiB, ), in Proceedings of the IEEE Conference on Local Computer Networks (LCN) 30th Anniversary, pp. 200–208, DOI 10.1109/LCN.2005.98, ISBN 0-7695-2421-4, Sydney, New South Wales/Australia, November 16, 2005, [BibTeX, XML]. Abstract: Reliable Server Pooling (RSerPool) is a protocol framework for server redundancy and session failover, currently under standardization by the IETF RSerPool WG. While the basic ideas of RSerPool are not new, their combination into one architecture is. Some research into the performance of RSerPool for certain specific applications has been made, but a detailed, application-independent sensitivity analysis of the system parameters is still missing. The goal of this paper, after an application-independent, generic quantification of RSerPool systems and definition of performance metrics for both service provider and user, is to systematically investigate RSerPool&apos;s behavior on changes of workload and system parameters to give basic guidelines on designing efficient RSerPool systems. Silverton, Aron J.; Xie, Qiaobing; Tüxen, Michael and Dreibholz, Thomas: ``Reliable Server Pooling Sockets API Extensions´´ (TXT, 19 KiB, ), Internet Draft draft-ietf-rserpool-api-00, IETF, October 17, 2005, [BibTeX, XML]. Abstract: This document describes a sockets-like API for the Reliable Server Pooling (RSerPool) protocol suite. This API provides applications within an RSerPool enabled system with a reliable communications layer via a highly-available socket interface (rsp_socket). Dreibholz, Thomas and Rathgeb, Erwin Paul: ``RSerPool – Providing Highly Available Services using Unreliable Servers´´ (PDF, 429 KiB, ), in Proceedings of the 31st IEEE EuroMirco Conference on Software Engineering and Advanced Applications, pp. 396–403, DOI 10.1109/EUROMICRO.2005.50, ISBN 0-7695-2431-1, Porto/Portugal, September 2, 2005, [BibTeX, XML]. Abstract: The Reliable Server Pooling (RSerPool) protocol suite currently under standardization by the IETF is designed to build systems providing highly available services by mechanisms and protocols for establishing, configuring, accessing and monitoring pools of server resources. Using RSerPool, critical infrastructure services like SS7 telecommunication systems, e-commerce transaction processing or distributed computing can be provided highly available using pools of unreliable servers. In this paper, we first give an overview of the RSerPool framework. In the following, we quantitatively show performance impacts of varying RSerPool parameters to failover handling, server selection efficiency and overhead traffic under server failure conditions. Dreibholz, Thomas: ``draft-ietf-rserpool-mib-01.txt – Management Information Base Definition for Reliable Server Pooling´´ (PDF, 2249 KiB, ), in Proceedings of the 63rd IETF Meeting, Paris/France, August 1, 2005, [BibTeX, XML]. Dreibholz, Thomas: ``Das rsplib–Projekt – Hochverfügbarkeit mit Reliable Server Pooling´´ (PDF, 1154 KiB, ), in Proceedings of the LinuxTag, Karlsruhe, Baden-Württemberg/Germany, June 24, 2005, [BibTeX, XML]. Abstract: In unserem Paper geben wir zunächst eine Einführung zu Reliable Server Pooling (RSerPool), danach stellen wir unsere Implementation vor – das rsplib-Projekt. Im Anschluß daran zeigen wir, wie basierend auf unserer Implementation eigene, hochverfügbare Anwendungen mit RSerPool entwickelt werden können – begleitet durch Code-Beispiele. Zum Abschluß stellen wir noch eine unserer Beispielanwendungen vor. Dreibholz, Thomas and Rathgeb, Erwin Paul: ``Implementing the Reliable Server Pooling Framework´´ (PDF, 467 KiB, ), in Proceedings of the 8th IEEE International Conference on Telecommunications (ConTEL), vol. 1, pp. 21–28, ISBN 953-184-081-4, Zagreb, Središnja Hrvatska/Croatia, June 15, 2005, [BibTeX, XML]. Abstract: The Reliable Server Pooling (RSerPool) protocol suite currently under standardization by the IETF is designed to build systems providing highly available services by mechanisms and protocols for establishing, configuring, accessing and monitoring pools of server resources. But RSerPool is not only able to manage pools of redundant servers and facilitate service failover between servers: it also includes sophisticated mechanisms for server selections within the pools. These mechanisms make RSerPool useful for the application in load balancing and distributed computing scenarios. As part of our RSerPool research and to verify results of our simulation model in real-life scenarios, we have created a complete implementation prototype of the RSerPool framework. In this paper, we will give a detailed description of the concepts, ideas and realizations of our prototype. Furthermore, we will show performance issues raised by the management of large servers pools, as it is necessary for load balancing or distributed computing scenarios. We will explain the algorithms and data structures we designed to solve these challenges and finally present a rough performance evaluation that verifies our concept. Dreibholz, Thomas; Rathgeb, Erwin Paul and Tüxen, Michael: ``Load Distribution Performance of the Reliable Server Pooling Framework´´ (PDF, 219 KiB, ), in Proceedings of the 4th IEEE International Conference on Networking (ICN), Lecture Notes in Computer Science, vol. 3421, pp. 564–574, Springer, DOI 10.1007/978-3-540-31957-3_65, ISBN 3-540-25338-6, Saint Gilles Les Bains/Reunion Island, April 21, 2005, [BibTeX, XML]. Abstract: The Reliable Server Pooling (RSerPool) protocol suite currently under standardization by the IETF is designed to build systems providing highly available services by providing mechanisms and protocols for establishing, configuring, accessing and monitoring pools of server resources. While availability is one main aspect of RSerPool, load distribution is another. Since most of the time a server pool system runs without component failures, optimal performance is an extremely important issue for the productivity and cost-efficiency of the system. In this paper, we therefore focus especially on the load distribution performance of RSerPool in scenarios without failures, presenting a quantitative performance comparison of the different load distribution strategies (called pool policies) defined in the RSerPool specifications. Based on the results, we propose some new pool policies providing significant performance enhancements compared to those currently defined in the standards documents. Dreibholz, Thomas and Rathgeb, Erwin Paul: ``An Application Demonstration of the Reliable Server Pooling Framework´´ (PDF, 330 KiB, ), in Proceedings of the 24th IEEE International Conference on Computer Communications (INFOCOM), Miami, Florida/U.S.A., Demonstration and Poster Presentation, March 16, 2005, [BibTeX, XML]. Dreibholz, Thomas: ``draft-ietf-rserpool-policies-00.txt – Definition of Member Selection Policies´´ (PDF, 2729 KiB, ), in Proceedings of the 61st IETF Meeting, Washington, DC/U.S.A., November 8, 2004, [BibTeX, XML]. Dreibholz, Thomas: ``An Overview of the Reliable Server Pooling Architecture´´ (PDF, 66 KiB, ), in Proceedings of the 12th IEEE International Conference on Network Protocols (ICNP), Berlin/Germany, Poster Presentation, October 7, 2004, [BibTeX, XML]. Abstract: The convergence of classical PSTN and IP networks requires the transport of SS7 signalling over IP. Since SS7 has very strict availability requirements to the signalling components, redundancy is mandatory. The goal of the IETF RSerPool working group is to define a lightweight, flexible and realtime redundancy concept to fulfil the availability requirements of SS7: Reliable Server Pooling (RSerPool). RSerPool is currently under standardization, its functionality and improvement are subject of our research. Our poster presents our RSerPool proof-of-concept implementation and a research oriented, discrete event based simulation model. We provide some simulation results showing problems of the server selection procedures defined in the standards and how we solved them. These improvements are now going into standardization by the IETF. Furthermore, we present some of our important results on efficient algorithms and data structures for pool management. The poster concludes with an outlook on our currently progressing examinations of service reliablity in failure scenarios. Dreibholz, Thomas: ``Member Selection Policies for the Reliable Server Pooling Protocol Suite´´ (PDF, 3299 KiB, ), in Proceedings of the 60th IETF Meeting, San Diego, California/U.S.A., August 5, 2004, [BibTeX, XML]. Dreibholz, Thomas: ``Policy Management in the Reliable Server Pooling Architecture´´ (PDF, 4930 KiB, ), in Proceedings of the Multi-Service Networks Conference (MSN, Coseners), Abingdon, Oxfordshire/United Kingdom, July 8, 2004, [BibTeX, XML]. Dreibholz, Thomas; Jungmaier, Andreas and Tüxen, Michael: ``A New Scheme for IP-based Internet Mobility´´ (PDF, 210 KiB, ), in Proceedings of the 28th IEEE Local Computer Networks Conference (LCN), pp. 99–108, DOI 10.1109/LCN.2003.1243117, ISBN 0-7695-2037-5, Königswinter, Nordrhein-Westfalen/Germany, October 22, 2003, [BibTeX, XML]. Abstract: In this contribution we present a new type of mobility management for IP-based networks that, contrary to conventional approaches, does not focus on the network layer, but on the transport and session layers. At the heart of this new mobility concept is the reliable transport protocol SCTP, with an enhancement for dynamic address reconfiguration. This is described in this paper. A session layer based on the reliable server pooling (RSerPool) protocol suite provides for sessionmonitoring and control. The suggested solution is transparent for applications,requires no changes in the network infrastructure, and is evaluated with a real-world implementation. Finally, we present first results from the application of this mobility concept to different mobility scenarios. These were obtained from working SCTP and RSerPool implementations that have been developed within our group. Dreibholz, Thomas and Tüxen, Michael: ``High Availability using Reliable Server Pooling´´ (PDF, 79 KiB, ), in Proceedings of the Linux Conference Australia (LCA), Perth, Western Australia/Australia, January 24, 2003, [BibTeX, XML]. Abstract: Providing fault tolerancy is crucial for a growing number of IP-based applications. There exist a lot of proprietary solutions for this problem, but free alternatives are rare. Currently, the IETF RSerPool working group is standardizing a protocol suite for Reliable Server Pooling, which copes with the challenge of providing high availability by using redundant servers. Servers for the same service are grouped into a server pool. A server in a pool is called pool element (PE), a user of a pool is called pool user (PU). When a PE fails, its PUs simply select another one from the pool and initiates an application-specific failover procedure. This fail-over is supported by the RSerPool protocol suite. Each PE registers at a name server and is then continously supervised by that specific name server. All name servers of an operational scope provide a redundant system for name resolution from pool handles to transport addresses of pool elements to pool users. RSerPool uses SCTP to provide network fault tolerance and address scoping functionality. The RSPLIB is a prototype implementation of the RSerPool protocol suite, developed under the GNU Public License in cooperation between Siemens and the Computer Networking Technology Group of the University of Essen. It currently runs under Linux, FreeBSD and Darwin. Our paper covers aspects of designing and implementing highly available applications using RSerPool with our RSPLIB implementation. First, we will give an introduction to the RSerPool protocol suite and an overview of the RSPLIB components. Then, we describe the RSPLIB API, especially focussing on the implementation of pool element and pool user programs to provide high reliability. Furthermore, we show our current implementation status and future plans. This will be followed by a short look on the problems that can arise when the RSerPool architecture is used. Finally, we give an example how RSerPool can be used to realize highly available services. And last but not least, we show how distributed computing architectures can make use of the RSerPool architecture. Dreibholz, Thomas: ``An Efficient Approach for State Sharing in Server Pools´´ (PDF, 111 KiB, ), in Proceedings of the 27th IEEE Local Computer Networks Conference (LCN), pp. 348–349, DOI 10.1109/LCN.2002.1181806, ISBN 0-7695-1591-6, Tampa, Florida/U.S.A., November 8, 2002, [BibTeX, XML]. Abstract: Many Internet services require high availability. Server pooling provides a high availability solution using redundant servers. If one server fails, the service is continued by another one. A challenge for server pooling is efficient state sharing: The new server requires the old one&apos;s state to continue service. This paper proposes a simple, efficient and scalable solution, usable for a large subset of applications. Previous versions: draft-dreibholz-rserpool-applic-distcomp-25, 24, 23, 22, 21, 20, 19, 18, 17, 16, 15, 14, 13, 12, 11, 10, 09, 08, 07, 06, 05, 04, 03, 02, 01, 00. Previous versions: draft-dreibholz-rserpool-applic-mobility-24, 23, 22, 21, 20, 19, 18, 17, 16, 15, 14, 13, 12, 11, 10, 09, 08, 07, 06, 05, 04, 03, 02, 01, 00. Previous versions: draft-dreibholz-rserpool-delay-22, 21, 20, 19, 18, 17, 16, 15, 14, 13, 12, 11, 10, 09, 08, 07, 06, 05, 04, 03, 02, 01, 00. Previous versions: draft-dreibholz-rserpool-asap-hropt-23, 22, 21, 20, 19, 18, 17, 16, 15, 14, 13, 12, 11, 10, 09, 08, 07, 06, 05, 04, 03, 02, 01, 00. Previous versions: draft-dreibholz-rserpool-nextgen-ideas-10, 09, 08, 07, 06, 05, 04, 03, 02, 01, 00. Previous versions: draft-dreibholz-rserpool-score-23, 22, 21, 20, 19, 18, 17, 16, 15, 14, 13, 12, 11, 10, 09, 08, 07, 06, 05, 04, 03, 02, 01, 00. Previous versions: draft-dreibholz-rserpool-enrp-takeover-20, 19, 18, 17, 16, 15, 14, 13, 12, 11, 10, 09, 08, 07, 06, 05, 04, 03, 02, 01, 00. Previous versions: draft-dreibholz-vnfpool-rserpool-applic-07, 06, 05, 04, 03, 02, 01, 00. Previous versions: draft-coene-rserpool-applic-ipfix-18, 17, 16, 15, 14, 13, 12, 11, 10, 09, 08, 07, 06, 05, 04, 03, 02, 01, 00. Previous versions: draft-ietf-rserpool-mib-12, 11, 10, 09, 08, 07, 06, 05, 04, 03, 02, 01, 00. Stewart, Randall R.; Xie, Qiaobing; Stillman, Maureen and Tüxen, Michael: ``Aggregate Server Access Protcol (ASAP)´´ (TXT, 116 KiB, ), RFC 5352, IETF, DOI 10.17487/RFC5352, ISSN 2070-1721, September 30, 2008, [BibTeX, XML]. Previous versions: draft-ietf-rserpool-asap-21, 20, 19, 18, 17, 16, 15, 14, 13, 12, 11, 10, 09, 08, 07, 06, 05, 04, 03, 02, 01, 00. Abstract: Aggregate Server Access Protocol (ASAP, RFC 5352), in conjunction with the Endpoint Handlespace Redundancy Protocol (ENRP, RFC 5353), provides a high-availability data transfer mechanism over IP networks. ASAP uses a handle-based addressing model that isolates a logical communication endpoint from its IP address(es), thus effectively eliminating the binding between the communication endpoint and its physical IP address(es), which normally constitutes a single point of failure. In addition, ASAP defines each logical communication destination as a pool, providing full transparent support for server pooling and load sharing. It also allows dynamic system scalability – members of a server pool can be added or removed at any time without interrupting the service. ASAP is designed to take full advantage of the network level redundancy provided by the Stream Transmission Control Protocol (SCTP, RFC 4960). Each transport protocol, other than SCTP, MUST have an accompanying transport mapping document. It should be noted that ASAP messages passed between Pool Elements (PEs) and ENRP servers MUST use the SCTP transport protocol. 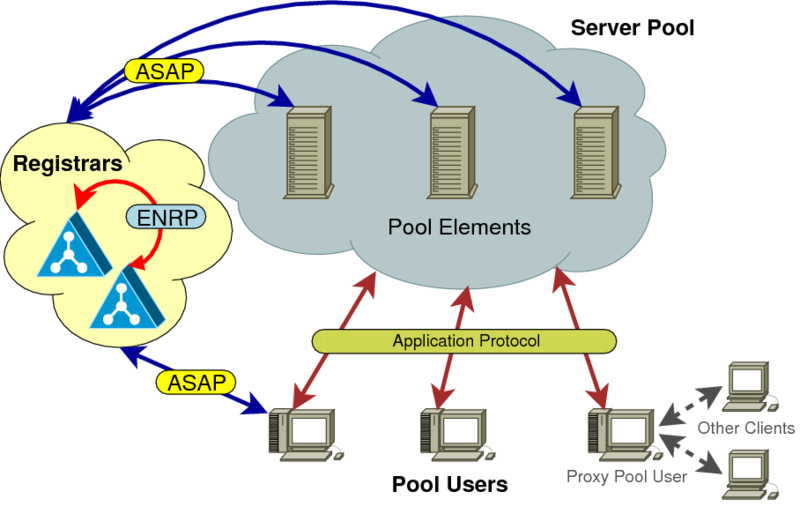 The high-availability server pooling is gained by combining two protocols, namely ASAP and ENRP, in which ASAP provides the user interface for Pool Handle to address translation, load sharing management, and fault management, while ENRP defines the high- availability Pool Handle translation service. This memo defines an Experimental Protocol for the Internet community. Stewart, Randall R.; Xie, Qiaobing; Stillman, Maureen and Tüxen, Michael: ``Aggregate Server Access Protocol (ASAP) and Endpoint Handlespace Redundancy Protocol (ENRP) Parameters´´ (TXT, 50 KiB, ), RFC 5354, IETF, DOI 10.17487/RFC5354, ISSN 2070-1721, September 30, 2008, [BibTeX, XML]. Previous versions: draft-ietf-rserpool-common-param-18, 17, 16, 15, 14, 13, 12, 11, 10, 09, 08, 07, 06, 05, 04, 03, 02, 01, 00. Abstract: This document details the parameters of the Aggregate Server Access Protocol (ASAP) and Endpoint Handlespace Redundancy Protocol (ENRP) defined within the Reliable Server Pooling (RSerPool) architecture. This memo defines an Experimental Protocol for the Internet community. Previous versions: draft-ietf-rserpool-overview-06, 05, 04, 03, 02, 01, 00. 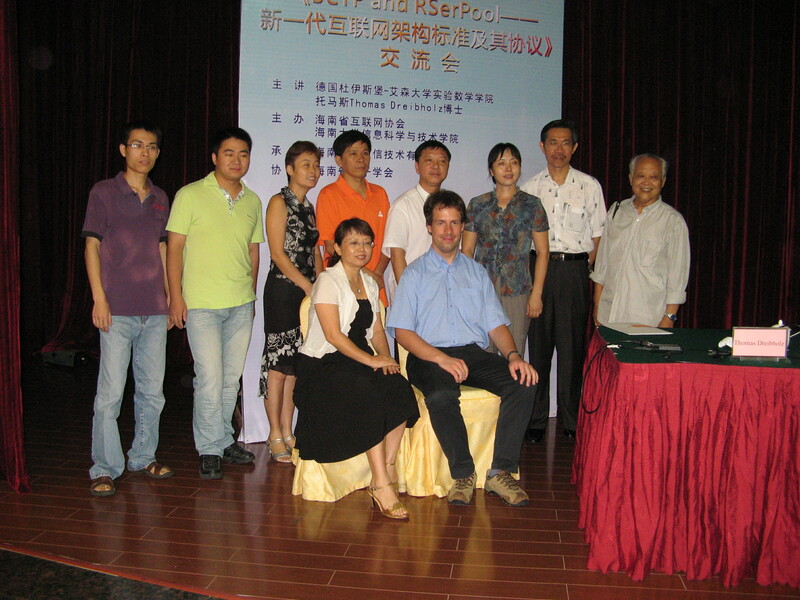 Xie, Qiaobing; Stewart, Randall R.; Stillman, Maureen; Tüxen, Michael and Silverton, Aron J.: ``Endpoint Handlespace Redundancy Protocol (ENRP)´´ (TXT, 82 KiB, ), RFC 5353, IETF, DOI 10.17487/RFC5353, ISSN 2070-1721, September 30, 2008, [BibTeX, XML]. Previous versions: draft-ietf-rserpool-enrp-21, 20, 19, 18, 17, 16, 15, 14, 13, 12, 11, 10, 09, 08, 07, 06, 05, 04, 03, 02, 01, 00. Abstract: The Endpoint Handlespace Redundancy Protocol (ENRP) is designed to work in conjunction with the Aggregate Server Access Protocol (ASAP) to accomplish the functionality of the Reliable Server Pooling (RSerPool) requirements and architecture. Within the operational scope of RSerPool, ENRP defines the procedures and message formats of a distributed, fault-tolerant registry service for storing, bookkeeping, retrieving, and distributing pool operation and membership information. This memo defines an Experimental Protocol for the Internet community. Previous versions: draft-ietf-rserpool-policies-10, 09, 08, 07, 06, 05, 04, 03, 02, 01, 00. Stillman, Maureen; Gopal, Ram; Guttman, Erik; Holdrege, Matt and Sengodan, Senthil: ``Threats Introduced by RSerPool and Requirements for Security´´ (TXT, 38 KiB, ), RFC 5355, IETF, DOI 10.17487/RFC5355, ISSN 2070-1721, September 30, 2008, [BibTeX, XML]. Previous versions: draft-ietf-rserpool-threats-13, 12, 11, 10, 09, 08, 07, 06, 05, 04, 03, 02, 01, 00. Historic versions: draft-stillman-rserpool-threats-02, 01, 00. Abstract: Reliable Server Pooling (RSerPool) is an architecture and set of protocols for the management and access to server pools supporting highly reliable applications and for client access mechanisms to a server pool. This document describes security threats to the RSerPool architecture and presents requirements for security to thwart these threats. This memo provides information for the Internet community. Loughney, John; Silverton, Aron J.; Stillman, Maureen; Xie, Qiaobing and Stewart, Randall R.: ``Comparison of Protocols for Reliable Server Pooling´´ (TXT, 55 KiB, ), Internet Draft draft-ietf-rserpool-comp-11, IETF, November 16, 2006, [BibTeX, XML]. Previous versions: draft-ietf-rserpool-comp-10, 09, 08, 07, 06, 05, 04, 03, 02, 01, 00. Abstract: This document compares protocols that may be applicable for the Reliable Server Pooling problem space. This document discusses the usage and applicability of these protocols for the Reliable Server Pooling architecture. Tüxen, Michael; Xie, Qiaobing; Stewart, Randall R.; Shore, Melinda; Loughney, John and Silverton, Aron J.: ``Architecture for Reliable Server Pooling´´ (TXT, 58 KiB, ), Internet Draft draft-ietf-rserpool-arch-12, IETF, November 14, 2006, [BibTeX, XML]. Previous versions: draft-ietf-rserpool-arch-11, 10, 09, 08, 07, 06, 05, 04, 03, 02, 01, 00. Abstract: This document describes an architecture and protocols for the management and operation of server pools supporting highly reliable applications, and for client access mechanisms to a server pool. Conrad, Phillip T. and Lei, Peter: ``Services Provided By Reliable Server Pooling´´ (TXT, 39 KiB, ), Internet Draft draft-ietf-rserpool-service-02, IETF, October 6, 2005, [BibTeX, XML]. Previous versions: draft-conrad-rserpool-service-03, 02, 01, 00. Abstract: The Reliable Server Pooling architecture (abbreviated "RSerPool", and defined in ), provides a set of services and protocols for building fault tolerant and highly available client/server applications. This memo describes the semantics of the services that RSerPool provides to upper layer protocols. Lei, Peter and Conrad, Phillip T.: ``TCP Mapping for Reliable Server Pooling Enhanced Mode´´ (TXT, 39 KiB, ), Internet Draft draft-ietf-rserpool-tcpmapping-03, IETF, October 6, 2005, [BibTeX, XML]. Abstract: This memo defines the shim protocol that maps the requirements of the ASAP protocol  to the capabilities of the TCP protocol . In particular, this shim protocol adds the following capabilties that are required by ASAP, but not provided by TCP: (1) message orientation, (2) heartbeat messages, (3) multiple streams, and (4) undelivered message retrieval (if provided). Xie, Qiaobing: ``RSerPool Redundancy-model Policy´´ (TXT, 18 KiB, ), Internet Draft draft-xie-rserpool-redundancy-model-03, IETF, Individual Submission, November 8, 2004, [BibTeX, XML]. Previous versions: draft-xie-rserpool-redundancy-model-02, 01, 00. Abstract: This document defines RSERPOOL Redundancy-model Member Selection Policy parameter and the related procedures. This policy is designed to be flexible and capable of supporting a wide range of advanced redundancy models found in some high availability systems. The design uses the extensibility in RSERPOOL pool load sharing policy. Coene, Lode; Conrad, Phillip T. and Lei, Peter: ``Reliable Server Pool Applicability Statement´´ (TXT, 28 KiB, ), Internet Draft draft-ietf-rserpool-applic-02, IETF, July 18, 2004, [BibTeX, XML]. Abstract: This document describes the applicability of the reliable server pool architecture and protocols to applications which want to have High avialebility services. This is accomplished by using redundant servers and failover between servers of the same pool in case of server failure. Processing load in a pool may de distributed/shared between the members of the pool according to a certain policy. Also some guidance is given on the choice of underlying transport protocol (and corresponding transport protocol mapping) for transporting application data and Rserpool specific control data. Tüxen, Michael; Xie, Qiaobing; Stewart, Randall R.; Shore, Melinda; Ong, Lyndon; Loughney, John and Stillman, Maureen: ``Requirements for Reliable Server Pooling´´ (TXT, 17 KiB, ), Informational RFC 3237, IETF, DOI 10.17487/RFC3237, ISSN 2070-1721, January 2002, [BibTeX, XML]. Previous versions: draft-ietf-rserpool-reqts-02, 01, 00. Abstract: This document defines a basic set of requirements for reliable server pooling. This memo provides information for the Internet community. If something is missing, see the Internet Draft archive at Watersprings.org. Please also contact me in case of missing or dead links. LaTeX source versions of the following teaching material are available on request. Write e-mail to Thomas Dreibholz. 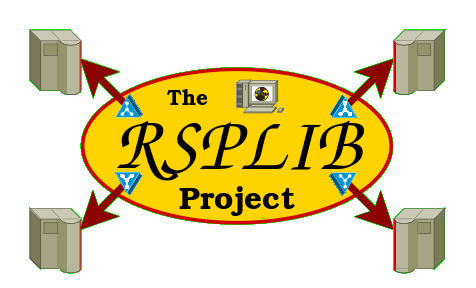 RSPLIB, socketapi and sctplib are released under the GNU Public Licence (GPL). Please have a look at the Handbook and the ReadMe files before installation! If you do not want to use kernel SCTP, you also need our userland SCTP implementation sctplib/socketapi. In this case, you also need the following two files. However, in most cases, you want kernel SCTP and simply use --enable-kernel-sctp at configure. If you are unsure, use kernel SCTP. See the handbook for details! Please have a look at the ReadMe file before trying this version! The files have been signed using my GnuPG key. You can find my public key here. 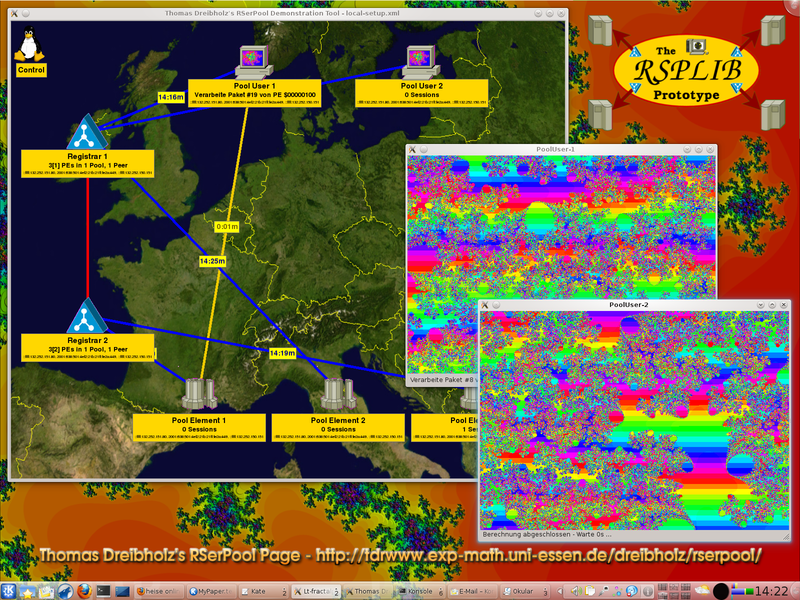 You will also find a mirror for the stable version files here: http://www.sctp.de/rserpool.html. To install RSPLIB under FreeBSD from the ports collection, just go to "/usr/ports/net/rsplib" and run "make && make install" (as root!). Now, the sctplib should be installed under /usr/local. If configure fails due to incompatible version of the sctplib, go to step 1 and install a compatible version first. Then, try again. To use userland SCTP, use the parameter --disable-kernel-sctp! Read the ReadMe file in the main directory for how to use the examples. RSPSIM is released under the GNU Public Licence (GPL). What about helping Wikipedia by adding an article in your language?